Getting fatigued is a normal part of life, but certain people feel profound tiredness all the times. Scientists agree that during the evening when it’s time to go to bed, it is normal to feel tired and sleepy, but it’s not normal if you feel that way in the morning after 8 hours of sleep. Chronic fatigue can be a real problem, and it can stay in the way of living a productive and happy life. This issue can be accompanied by other symptoms, and if it is prolonged indefinitely, the person in question might develop more serious health conditions. How do I know I’m chronically fatigued? If you have one or more of the symptoms above, it is possible that you might be chronically fatigued. This can happen for a wide variety of reasons. For example, there might be hormonal deficiencies in your system which can render one unable to recover properly. The human body is extremely complex, and your fatigue problem might be difficult to spot at first. For example, some people might have low testosterone levels; others might encounter adrenal deficiencies or thyroid dysfunction. How does a complete fatigue panel help me? A complete fatigue panel is designed to analyze multiple hormones in the body to determine in which ones a person might be deficient. This can be done by drawing blood and saliva sample and sending them to a lab for complete analysis. What are the advantages of getting a fatigue panel? How is chronic fatigue diagnosed by this panel? As mentioned earlier, a complete fatigue panel runs multiple tests to determine vitamin or hormone deficiencies in one’s body. Let’s take a closer look at these tests and find out more about them. The thyroid gland is situated in the neck, and it is responsible with regulating countless hormones and substances in the body. If it doesn’t function correctly, the person in question might feel fatigued and lack motivation. Hypothyroidism happens when the thyroid gland gets “lazy,” meaning it doesn’t produce the required amount of hormones for the body to function correctly. People who have hypothyroidism might feel tired most of the times, and this is usually accompanied by other symptoms such as weight changes, loss of appetite, and poor concentration. Free T4 Test – this type of test looks at a hormone in the body called thyroxine (T4). Thyroxine is then converted to T3 which is a hormone that regulates body temperature, helps in producing energy and monitors heart rate. People who have hypothyroidism might experience a decreased production of thyroxine which can lead to excessive fatigue, lack of motivation, and other symptoms. TSH test – TSH stands for thyroid stimulating hormone which is a type of hormone produced by the pituitary gland. The fatigue panel looks at the levels of TSH in your bloodstream to determine if you have too much or too little TSH. This hormone is important because as its name implies, it stimulates the thyroid gland to produce T4 and T3 hormones. If the TSH levels are too high, the thyroid gland might work overtime which leads to thyroid dysfunction and fatigue. Free T3 Test – We talked about the T3 hormone earlier in the “Free T4 Test,” and we learned that the T3 gets converted from T4. This hormone (T3) is also responsible with regulating the heart rate, body temperature, and other important body functions. If the levels of unbound triiodothyronine (T3) are too low, this might result in excessive fatigue which can last for weeks and even months. It is important to mention here that a high-quality fatigue panel looks at the free levels of T3 in the body, not only at the total T3 levels, because these are the most responsible with regulating energy and causing fatigue. Testosterone is one of the most important hormones in the body for men AND women. Today, it is a well-known fact that low testosterone levels are responsible for the lack of motivation, low energy, and even mild depression in some cases. The testosterone is available in 2 ways – free and bound to proteins. A high-quality fatigue panel looks at the total testosterone levels as well as free testosterone levels (unbound to proteins) to determine if this is indeed the main cause of excessive tiredness in men and women. The total testosterone test measures the whole spectrum of testosterone in one’s body. For men, this should be between 300 and 900 nanograms per deciliter of blood, but this depends on lifestyle, age, body composition, and other factors. When the total testosterone levels drop below 300 ng/dl, then a condition known as hypogonadism develops. This diagnosis an be a serious cause of excessive fatigue and other symptoms and body changes such as lack of concentration and male breast development (gynecomastia). The free testosterone test looks specifically at the unbound testosterone levels. It is important to measure those in particular as well because a low amount of them can account for excessive fatigue in men and women of all ages. Anemia is a serious problem which can become very dangerous for one's health if left untreated. Anemic people usually have too few red blood cells in the bloodstream. As you probably already know, red blood cells are responsible for transporting oxygen and nutrients to cells, tissues, and organs throughout the entire body. Having too few red blood cells can cause various symptoms such as excessive tiredness, dizziness, irregular heartbeats, etc. The fatigue panel runs various test to determine the level of hemoglobin in the body (a protein responsible with carrying oxygen) as well as analyzing hematocrit values (the volume of red blood cells in the bloodstream). The hematocrit tests look at the percentage of red cells in the bloodstream. A small percentage might be indicative of anemia as well as chronic fatigue. The hemoglobin tests measure the level of hemoglobin in the body. Again, if this protein is in small quantities, one can develop anemia. The Mean Corpuscular Volume (MCV) tests look at the actual size of the red blood cells. This is important because if the size of these cells is too small, this might be the result of iron deficiency. If the cells are too large, this might be linked to vitamin B6 or folic acid deficiency. The Red Cell Distribution Width (RDW) values are also measured in conjunction with the MCV to determine the potential cause of anemia. Just as cars need to burn fuel to move from one place to the other, your body also requires an adequate supply of fuel to function correctly. If vehicles have gasoline, we as humans have glucose (or sugar). Normal blood sugar levels help one have sufficient energy to get him through the day. However, too much or too little blood sugar levels can lead to multiple serious health conditions as well as excessive fatigue. When the body detects that there is a high amount of sugar in the bloodstream (particularly after eating meals full of carbs and fats which are metabolized into glucose in the body), it will signal the pancreas to produce a hormone called insulin. Insulin acts as a locksmith who opens up cells, so they can absorb the excessive glucose in the bloodstream and produce energy. When the blood sugar levels return to normal, the pancreas stops producing insulin and the cycle repeats. However, when too much glucose is detected in the bloodstream on a regular basis, the pancreas is forced to produce higher amounts of insulin which might then drop the sugar levels too low. As a result, your cells and organs won’t have as much fuel at their disposal, and you start to feel tired all the times. Furthermore, when there is an excessive amount of sugar in the blood for several years in a row, the cells in the body start to develop resistance to insulin, meaning that they won’t “open up” as efficient as before to absorb glucose and produce energy. This can lead to diabetes which is a serious medical condition. High amounts of glucose can also lead to other problems such as slow circulation, higher risk of inflammation in the body, less oxygen transported to cells, and organs, etc. People who experience these symptoms are also fatigued most of the times despite having normal sleep schedules. Even those who have high blood sugar levels but do not have diabetes yet can still feel tired most of the times, in comparison with people with normal glucose levels. A fatigue panel is designed to test the glucose levels and determines if one is predisposed to diabetes type I and II. Such tests also measure the average glycated hemoglobin levels (A1c) which are sugar-coated oxygen-carrying red blood cell proteins. A high level of these cells can indicate a predisposition to diabetes at some point in the future and can be linked to chronic fatigue. The adrenal glands are situated just on top of your kidneys and are responsible for generating multiple important hormones such as epinephrine (adrenaline) and cortisol. Think of them as responsible with the “fight or flight” response when you’re stressed out, scared or excited. These glands are very important because if they don't function correctly, one can develop chronic fatigue as well as mild signs of depression. Studies show that approximately 40% of people over 60 years of age have to deal with constant tiredness associated with a reduced adrenal function. We all live stressful lives and have to juggle a thousand problems and responsibilities every day. This makes the adrenal glands pump a lot of cortisol and adrenaline into the body. Too much of these hormones can make someone feel very stressed, mildly depressed and fatigued. Poor sleep quality can also worsen the problem because the adrenal glands tend to recover when the body is at rest. Most people don’t get enough sleep during the night, so these glands don’t get a chance to rejuvenate properly. Add periodic stimulants to the equation (alcohol and drugs), and the load on the adrenal glands can quickly become overwhelming. Adrenal problems don’t only translate into constant fatigue. They are also accompanied by dizziness, poor concentration, anxiety and panic attacks, etc. The DHEA test looks at the levels of DHEA-S in the body. This is an androgen hormone, and if it is excessively high quantities, the person in question might suffer from adrenal hyperplasia. Similarly, if the levels of DHEA-S are insufficient, this can lead to chronic fatigue. The salivary cortisol test is also important in determining the differences in the cortisol levels at different moments of the day. Patients will be asked to collect four saliva samples during the day, and this will indicate whether the adrenal glands function properly or they produce too much cortisol on a regular basis. As you probably already know, the immune system is responsible with neutralizing viruses and bacteria which get in the body, so you don’t get sick all the times. It relies on a series of cells such as the T cells and other hormones to identify viruses and eliminate them before they get a chance to multiply. An immune system which functions properly requires energy. If there is too much inflammation in the body (as a result of injury, being exposed to a lot of viruses and toxins, etc. ), this system will work overtime to protect your health, and it will consume vast amounts of energy, leaving you fatigued and in a bad mood. A complete fatigue panel includes tests which measure the number of white cells in the bloodstream. These cells are responsible for neutralizing viruses and bacteria as well. In some rare cases, the bone marrow might not produce sufficient white cells, and this can be a sign of a more serious problem. Iron is an important element in the body as it is responsible for producing red blood cells which help to carry oxygen to organs and tissues. If one doesn't have sufficient iron in his body, this can lead to anemia which is characterized by fatigue, dizziness and a general sense of weakness. The ferritin test looks at the ferritin levels in the bloodstream. This is a protein responsible with storing iron, and if its levels are insufficient, one can develop anemia which leads to excessive tiredness. A reason why ferritin levels might be very low is that one donates too much blood every year. Studies show that donating blood more than twice a year can deplete ferritin levels which leads to anemia. The TIBC test (total iron binding capacity) looks at the total levels of iron available in the bloodstream. If this value is too high, then the amounts of iron in the body are insufficient, and this can be the cause of excessive fatigue. 1. Do I need to fast before getting tested? It is recommended to do a fasting session of 8-12 hours before drawing blood. Also, biotin supplementation should be stopped 72 hours before being tested. 2. How quickly are the results delivered? In most cases, you will get the results by email in a few business days. 3. What specimens are submitted for testing? Fatigue panels require patients to submit a blood specimen and in some cases, a saliva specimen for testing. The instructions on how to manage and properly collect these samples are provided within the package, so you will know exactly what you have to do. 4. What should I do after I get the results? Your results will be interpreted by your healthcare provider who will offer adequate treatment options if necessary. For example, if you have iron deficiency and this is the main cause of your fatigue, you’ll be guided on supplementing with iron for some time. Similarly, if your fatigue is caused by low testosteroneor thyroid hormone blood levels, you'll be advised to explore solutions such as Testosterone Replacement Therapy (TRT)or thyroid hormone replacement to help to deal with your fatigue problem. 5. Is this test safe? Yes! The submission of samples and results analysis is completely confidential, and you’ll be drawing blood in a medical setting under specialized supervision. Diagnosing chronic fatigue is not easy, but by ordering a comprehensive fatigue panel, you’re one step closer to feeling better. 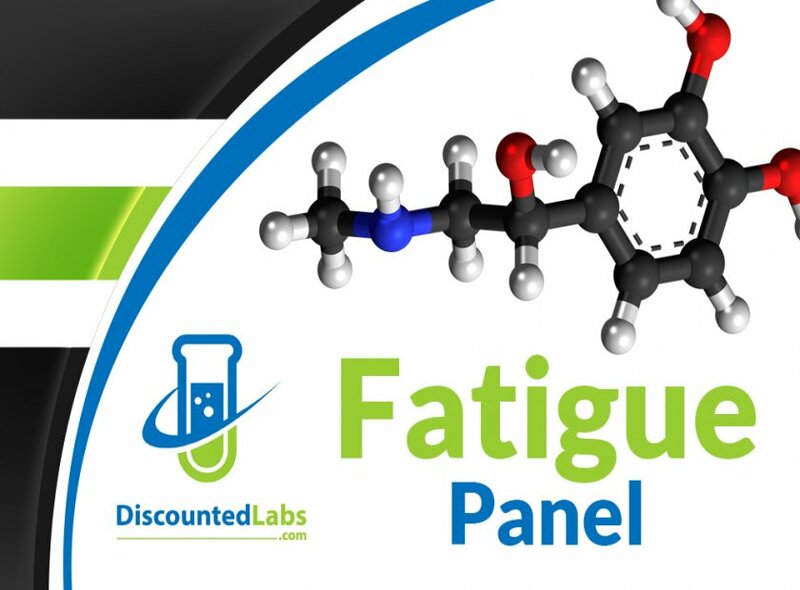 Order the complete fatigue panel today from https://www.discountedlabs.com, and you can drastically improve the quality of your life!